Glenview Baptist Church Library has been a prayed-for ministry since 1993. Our goal is to be a dynamic resource provider of media to enhance the quality of Bible study and to stimulate Christian growth and enrich general interest. Wise Men Seek Knowledge (Prov. 10:14) is in calligraphy on our wall and written in Greek and Hebrew, while the two layers beneath list Christian values. Our children’s area has a larger percentage of selections than most church libraries. Children have been our heart’s direction, as we believe children that read have an advantage in their future. Our staff is proud of our volunteers of all ages who serve in numerous areas. This is truly a ministry that will utilize your spiritual gifts. Some of our volunteers work about one every five weeks at the circulation desk; several work on Wednesday mornings writing slips, covering books, and assisting with other hands-on tasks. 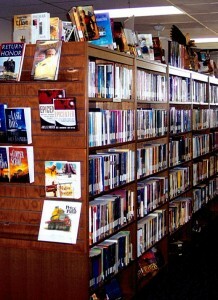 We also have staff that shelve media and some read the shelves to keep our books, audio books, CD's, and DVDs in order.